Sol Kerzner was born the youngest of the four children of Jewish-Russian emigrants and he grew up in the poor suburbs of Johannesburg. In 1979, he established a number of world-renowned resorts before embarking on his big mission — building Sun City. Now Sun City has grown to be one of the most popular destinations in the world, which has managed to attract a large number of international artists, such as Elton John, Queen and Ray Charles. His story and success have been a constant source of lessons for the younger generation on following your dreams and never giving up. That said, what are the 10 things you need to know about Sol Kerzner? The South African real estate tycoon was born in August of 1935 to Russian Jewish immigrant parents. His parents made their own living running a small hotel on the beachfront and Sol Kerzner seems to have made good on the initial promise that they showed. His company, Kerzner International now owns quite a lot of property including the lavish Atlantis hotel and casino resort in the Bahamas. The billionaire left South Africa at some point when faced with charges of alleged bribery. He focused then on the Caribbean and the United States. His success after his tainted reputation was hard won but he prevailed nonetheless. Before all his success. however, Sol Kerzner graduated from the South African army and did a further degree in Accounting at the University of Witwatersrand in Johannesburg. The South African tycoon has been married four times and in 1978, his second wife committed suicide. He is said to have never recovered fully from her death. Kerzner had five children from his first two marriages. Unfortunately, his son Butch Kerzner who looked most likely to succeed him was killed in a helicopter crash in 2006. His remaining kids are Andrea Kerzner, Beverly Kerzner Mace, Brandon Kerzner and Chantal Kerzner Sweeney. Sol Kerzner has an estimated net worth of $400 million which comes mostly from his hotels business. Sol Kerzner seems to have turned his sights to houses now. Together with his daughter, Andrea, he is supervising the construction of a stunning luxury security estate in Leeukoppie, Cape Town. He bought his first hotel in Durban, South Africa, in 1962. The hotel rapidly became a huge success in South Africa; as a result, he decided to build another 5 star-graded hotel in Umhlanga, South Africa. This was followed by his opening of the Beverly Hills’ hotel in 1964, with a succession of Southern Sun hotels in 1969; and the empire of other resorts he has, so far, managed to establish for himself from that time to date. 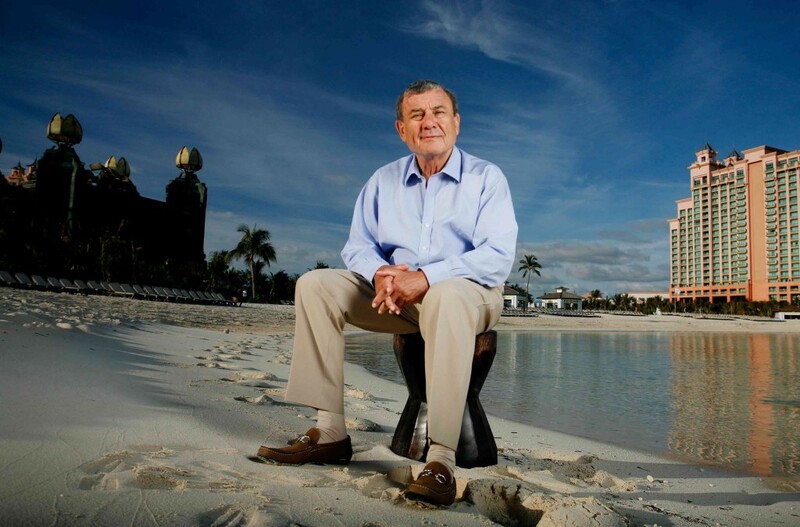 Sol Kerzner Built Two Man-made Lakes, Four Hotels and 2 Gary-player Golf Courses over a Period of 10 Years. Among his numerous achievements, the two man-made lakes, four hotels, as well as the two Gary-player golf courses he built within 10 years are considered part of his greatest establishments. At that same time, he also established an entertainment centre that contained a 6,000 multi-seat arenas, in which he invited a large number of superstars to perform: Liza Minelli, Frank Sinatra, Queen, Elton John, Shirley Bassey and Rod Steward among others. Sol Kerzner has been married four times and has a total of five children with six grandchildren. His first wife was Mary Adler, with whom he had three children. He later divorced her and married Sylvia Bestbier and together they had two children before she committed suicide in 1978. Third on the line was the one time Miss World, Anneline Kriel. They stayed in the same house for five years before divorcing. Currently, he is married to his fourth wife, Heather Kerzner, who brought with her two step-sons, Charlie and Savanna. Kerzner suffered a heart attack that almost got him killed in 1980. There were rumours that this heart attack had been triggered by his bad temper and womanizing habits. On October 11, 2006, his son and apparent heir (Howard Butch Kerzner) was involved in a terrible helicopter crash in Puerto Plata near Sosua, Dominican Republic. He died after the accident. Kerzner and his late son were in debt in 2005 after they delisted their company from the New York stock exchange at a cost of $3.6 billion. However, they sold the two “one and only’s” and Atlantis to Brookfield. And since then, he is still receiving a 5% dividend from Connecticut, and he will continue receiving the dividends until the end of the year 2014. Sol Kerzner got back into the business of developing and designing properties and built a casino that will be competing with Mohegan Sun. His company, Kerzner International Holdings Limited, agreed to partner with the largest privately owned resort company in China, Fosun International Limited, to establish an Atlantis Resort in Hainan Island, South China Sea. The project consumed a $1.6 billion and was launched in January 2018. Kerzner’s fourth wife was once a best friend to Christina Estrada, who was by then engaged to Sol Kerzner. But surprisingly, Kerzner ditched her after a seven-year courtship to marry her best friend, Heather Murphy. Following his complacent contribution in the business industry of Bahamas, Queen Elizabeth II awarded him the insignia of a Knight Commander in the highly distinguishable order of Saint Michael and King Georges (KCMG). After investing $1.6 billion in the Atlantis resort project in Dubai, Sol Kerzner spent a further $20 million to launch the resort. This party has been recognized as one of the biggest parties that have ever been held in the history of the world; furthermore, it has been ranked above the Beijing Olympics. The party launch was shown on CNN and Sky Broadcast. And in an interview, Kerzner expressed how he didn’t regret spending such a huge amount on a launch party since he felt the $1.6 billion investment was worth it.